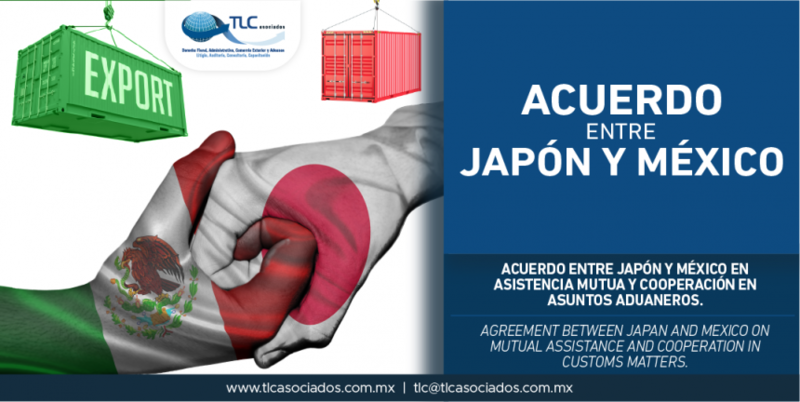 DECRETO PROMULGATORIO DEL ACUERDO ENTRE EL GOBIERNO DE LOS ESTADOS UNIDOS MEXICANOS Y EL GOBIERNO DEL JAPÓN SOBRE ASISTENCIA MUTUA Y COOPERACIÓN EN ASUNTOS ADUANEROS, HECHO EN LA CIUDAD DE MÉXICO, EL DIEZ DE AGOSTO DE DOS MIL DIECISIETE. ÚNICO.- El presente Decreto entrará en vigor el veintinueve de julio de dos mil dieciocho. PROMULGATORY DECREE OF THE AGREEMENT BETWEEN THE GOVERNMENT OF THE MEXICAN UNITED STATES AND THE GOVERNMENT OF JAPAN ON MUTUAL ASSISTANCE AND COOPERATION IN CUSTOMS MATTERS, DONE IN THE CITY OF MEXICO, ON AUGUST TEN OF TWO THOUSAND AND SEVENTEEN. SINGLE.- This Decree will come into force on July twenty-ninth, two thousand and eighteen.